Find out everything you need to know on the new Ds Ds 3 from independent vehicle review website Car And Driving. You can watch the video review to the left to see more of the car or read their written review below to get a true insight from an expert in the automotive industry. The sporty DS3 hatch offers style with citycar running costs in the shape of the BlueHDi 120 diesel version. Jonathan Crouch reports. Before the DS marque struck out on its own, the DS3 was merely a big seller for a huge company. Now, this compact sporty three-door hatch has to carry the expectations of a much smaller brand as it takes its first steps in the big wide world. Small wonder, then, that DS has broadened its appeal by offering buyers the option of a more exciting and more economical mid-range PureTech 110 petrol engine. Although the DS3 used to be a Citroen, the DS brand has been allowed to fly the nest and try to make its own way in the world. These days, you'll find no mention of the word 'Citroen' anywhere on the car. The only hint is the two chevrons on the grille, but they'll be taken out come refresh time. It's a bold move by Citroen, but considering that the DS3 is such a popular car, rivalling the MINI and the Fiat 500 with its stylish aesthetic and younger target market, perhaps we'll see some success come of it. DS is certainly hoping so, but to be successful, you first need a competitive and desirable range. The DS3 has the 'desire' part down to a tee, but the aging engine range for so long fitted to this model was becoming a little stagnant in the fast-moving world of automotive engineering. Today though, this car has more up-to-date oily bits and here we're looking at one of the more enticing of the powerplant options, a 110PS version of the Peugeot-Citroen alliance's fruity 1.2-litre PureTech petrol engine. This replaces the old 1.6-litre VTi unit, which may have had 10PS more power but lost out to the newcomer in terms of torque. The three-cylinder PureTech engine has already been lauded in the press for its sterling service in the Peugeot 308, so a 110PS version appearing in the DS3 is a welcome addition to the range, especially in place of the old, naturally aspirated 120PS VTi unit. In terms of handling, the drive should be as sharp as ever. With an immediate response to inputs from the helm, the '3' is an enjoyable B-road blast, and that enjoyment shouldn't be hindered by the 110's performance figures. Even though the 110PS PureTech powerplant has less outright power than the unit it replaced, it's torquier, with 205Nm taking it from nought to 62mph in 9.6 seconds and up to a 118mph top speed. It should be smooth, too, because Peugeot-Citroen has gone to great lengths to make the little engine immensely well balanced, thus negating the off-beat thrum normally associated with three-pots. Those choosing the convertible will be rewarded most, because the engine's characterful buzz at high revs will permeate into the cabin and give it an eager, sporty feel. While the engine under the bonnet and the badging on top of it may have changed, not much else about this current DS3 is much different from the original. It's still as thoroughly modern as ever and judging by the fact that it's becoming a common sight on British roads, the popularity doesn't seem to have diminished. The real advantage of the DS 3 has always been that it's more functional than the Fiat 500 or the MINI - both of which are more 'retro' in their design but attract the same kind of buyers - without being any less stylish. With usable rear seats and a decently sized luggage bay, the '3' is still the most practical machine in its class. From the driving seat, the DS3's cabin is busy, with a plethora of buttons and displays. It's all a bit overwhelming at first but you get used to it and then everything is fairly logically arranged. Build quality is fair to middling, with some very tactile buttons and leather offset by the odd swathe of cheap and nasty plastic. The seats aren't brilliant either, holding you in well but never managing to be that supportive or comfortable. This PureTech engine is offered on most of the DS3 trim levels. Inevitably perhaps, the bottom-rung 'DSign' model is still only available with the basic 82PS 1.2-litre petrol unit, but the popular mid-range 'DStyle' and 'DStyle Nav' models are both offered with this 1.2-litre 110PS petrol powerplant. Prices start from around £17,000 for the 'DStyle' hatchback, with the convertible costing another £2,000. At this trim point, you'll get alloy wheels, air conditioning, a 7in touchscreen, cruise control, gloss black inserts on the dash and LED daytime running lights. Spending a further £1,000 on the 'DStyle Nav' model will buy you 17in two-tone alloy wheels, satellite navigation and rear parking sensors. Both trims are offered with a six-speed automatic gearbox, and that will set you back an extra £1,500. Customisation plays a key role in the DS3's appeal, so options are plentiful and include various bright paint jobs, decals and contrasting roof colours, as well as more common peripherals such as a reversing camera, an improved stereo, an armrest and a spare wheel. The real advantage of the smaller turbocharged engine is not performance but fuel consumption. Returning 62.8mpg with the standard six-speed manual gearbox and emitting CO2 at the rate of 107g per kilometre (104g/km for the soft-top), the PureTech unit is a genuinely economical little car. Even a much smaller VW Up with its 75PS 1.0-litre engine will only return just over 60mpg. Choosing the automatic gearbox will have a detrimental effect on your fuel consumption though, albeit only a minor one. For the soft-top, fuel economy drops to 57.6mpg, but the hard-top's figure isn't quite so badly affected, falling from the same 62.8mpg as the convertible to 60.1mpg. CO2 emissions will suffer marginally too, rising to 108g/km for the fixed-roof variant and 112g/km for the folding-top model. Even so, road tax will still cost you tens of pounds a year, rather than hundreds. Because the performance is peppy enough without being too lairy, insurance costs should be low too, and because DS is still only really a sub-brand of Citroen and shares dealerships, you'll be paying sensible, mainstream manufacturer prices for servicing and maintenance. Now that the DS sub-brand has gained independence from its Citroen mother, it's understandable that the brand should want to add to the appeal of its best seller - the MINI-rivalling DS3.The first line of attack is to fit this impressive 110PS version of the rather good PureTech three-cylinder engine that PSA (which owns Citroen, Peugeot and DS) has put to such good use in the Peugeot 308. 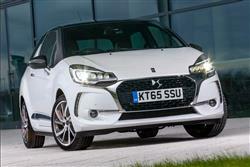 Providing a respectable sub-10-second 0-62mph time and fuel economy in the lower 60s, as well as cheap road tax, the 1.2-litre motor might well now offer the sweet spot in the DS3 range. While the arrival of its PureTech engineering cleverness won't address all this model's foibles, this likeable sporting supermini is a popular car and the higher-tech engine should be enough to keep sales strong as the fledgling DS brand finds its feet.